A showcase to be seen from all angles! Everyone with a ring side seat to partake in the evening gala event. A glowing center stage with four screens above to shine above the crowd. Gobos to create new patterns on dull walls to give them texture and depth. 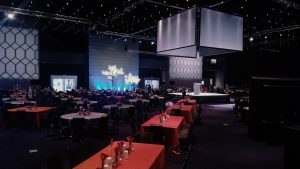 Reinforced sound, lighting, and video far above the stage to make the most of the room for attendees to mingle, dance and dine.